In this large-scale project, Dalí reinterpreted Goya’s famous series by introducing his own surrealist elements and satirical interpretation to the issues Goya presented in his etchings: vices, abuses of power and the relationship between men and women. For the published edition, the reworked plates were then re-titled by Dali below the image with repartee to Goya's. 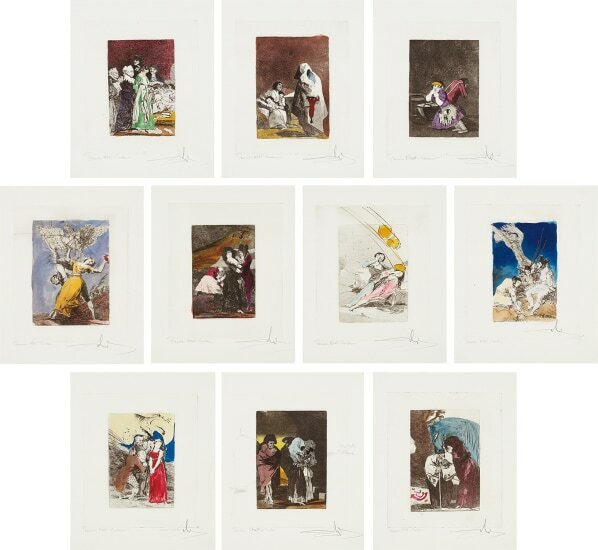 Ten heliogravures made from Goya's print series (circa 1799 edition) reworked and altered with drypoint and extensive hand-coloring, before Dali's titles and plate numbers were engraved in the plates, on Rives BFK paper, with full margins. All signed and annotated 'Premier Etat-Couleur' (first colored state) in pencil, two with additional proofing notations in the margins in pencil (all hand-colored proofs before the edition of 200 and 20 artist's proofs), including a copy note from Denise Rigal (Atelier Rigal) dated '18.07.15' describing how the series was printed and these examples were colored by Dali, the edition published by Berggruen/Editions Graphiques Internationales, Paris, all unframed.